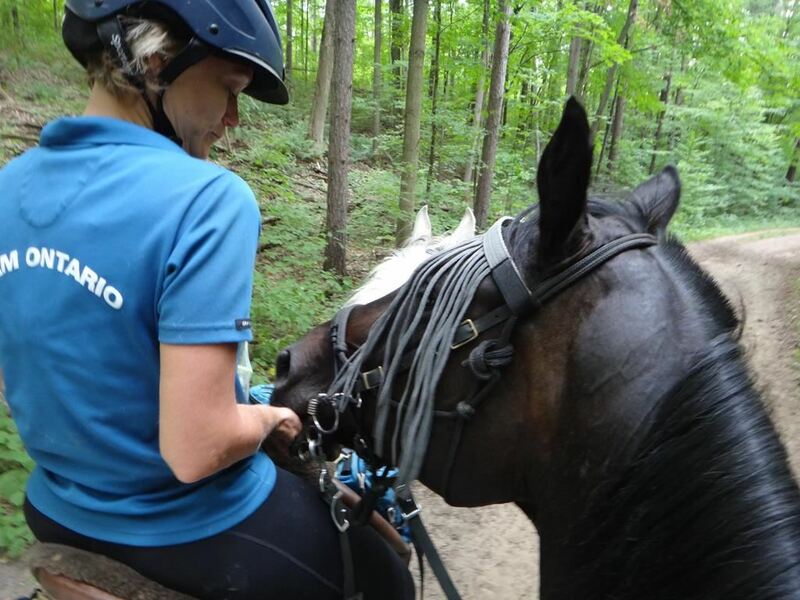 Ana has been riding Ares three days a week, very faithfully for almost a month now. In the beginning she was just riding in the round pen, as Ares learned some very basic skills. But we’ve been taking him out for short rides around the farm for the last couple of weeks. And even across the road to other trails. Dressy is a pretty good babysitter, and Ares likes her. This morning though, on my way to catch Dressy, I passed King standing in the stall next to Twister (being his buddy, since Twister needs to be in during the day for his eye to heal). King neighed at me. His own patented loud bellow. “HEY!!!!! I have no FOOD!! !” I laughed at him and gave him a scratch. Then, diverted, realized that I wanted to ride him, not Dressy. He was quite pleased with that turn of events, and marched out cheerfully after me to the trailer to be tacked up. I had to drop the girth four holes from Dressy’s size of course. I told him he should be mortified, but he didn’t care one bit. We ambled off to tour the farm. King was very happy to be out, probably more because of the oceans of grass everywhere than anything else. The pastures are dry and grazed down to nothing. So all that tall grass was mouth watering. In an effort to overcome his grass hypnosis, I got him moving along a little faster. 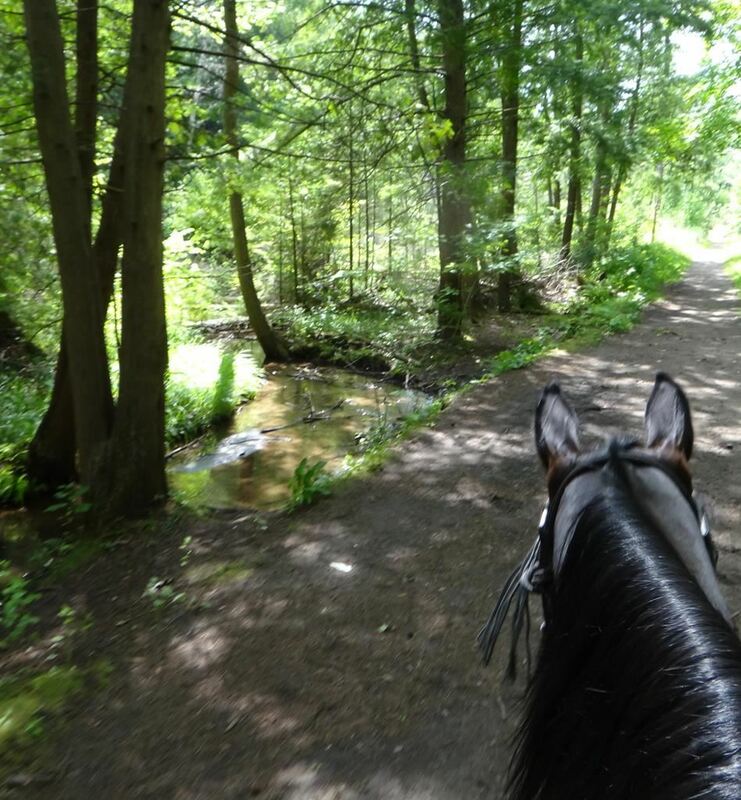 We had a nice little trot and then he volunteered his lovely floating canter. I had a rush of joy as we cantered along. He was happy and relaxed, and it was a perfect moment. King, at his best, is the loveliest horse I’ve ever ridden in my life. Powerful, balanced, and smooth. A dancing horse. 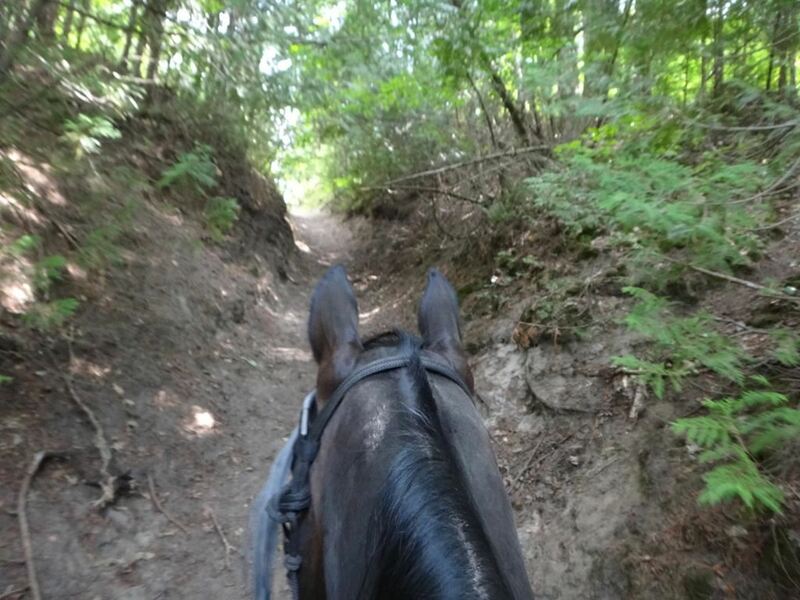 We visited one of my short forest trails, which was a first for Ares. He handled it well, even though it’s a bit overgrown and has some downed branches that I need to clean up. Ares is learning to cope with all sorts of different obstacles with aplomb. We came back out into the big field, and King was again mesmerized by GRASS. Sigh. Eventually I had to flap the reins at him to insist. And then gave King a light slap with the end. It didn’t even register with King, but YIKES. Ares was beside us, and I guess he thought I was going to kill him. He spooked a bit, eyes like dinner plates. Ana, who is very gentle with him, didn’t really take a strong enough hold, and he decided to go home. Not galloping wildly. Just… going home. Jogging. I yelled at her to circle him. But he has a treeless saddle, and I think he’s starting to lose weight and get fitter, so the girth has gotten a bit loose (it’s on the top hole both sides now). Ana slipped a bit sideways. To her very great credit, she righted herself several times as she went out of sight. Ares still jogging along with his head way up. Oh damn it. King watched this display without alarm. Ares was, after all, not moving very fast. But when they went completely out of sight, he got a bit indignant at being left behind. I did not think it would be the best idea to go thundering madly after them, so we walked (bouncy, sideways, and very light on the front end, but yes, walking). I fully expected to find Ana off the horse up ahead somewhere. But after a couple of minutes she reappeared riding Ares back towards me. That was a huge relief. I was very worrried that both Ana and Ares would lose confidence with an incident like that. I had her dismount and check the girth. Then bring him over to me so I could reassure him that no, I was NOT planning on killing him where he stood. He was a bit trembly, but settled down as Ana and I rubbed and talked to him. Ana got back on and we carried on. We took the horses down the farm lane and back to the round pen a few times. Making Ares work hard in the pen, and then walk quietly down the lane again. I didn’t want him thinking too much about how great it would be to go home. So we did that a few times and he was much more relaxed after a few repetitions. I was very impressed with Ana’s fortitude. She has never had her own horse or even regular access to a horse other than some lessons. Which means no experience outside of an arena. She lost a stirrup and the saddle slipped off center. And she maintained her balance, got control of Ares, and managed to ride him back. All without panicking or clutching up badly. The only mistake she really made was that she was afraid to hurt his mouth, so she didn’t take a strong enough hold and turn him back when he decided to opt out. Here’s another great photo of King. Again, taken by Dannie (Twister’s grandmother). 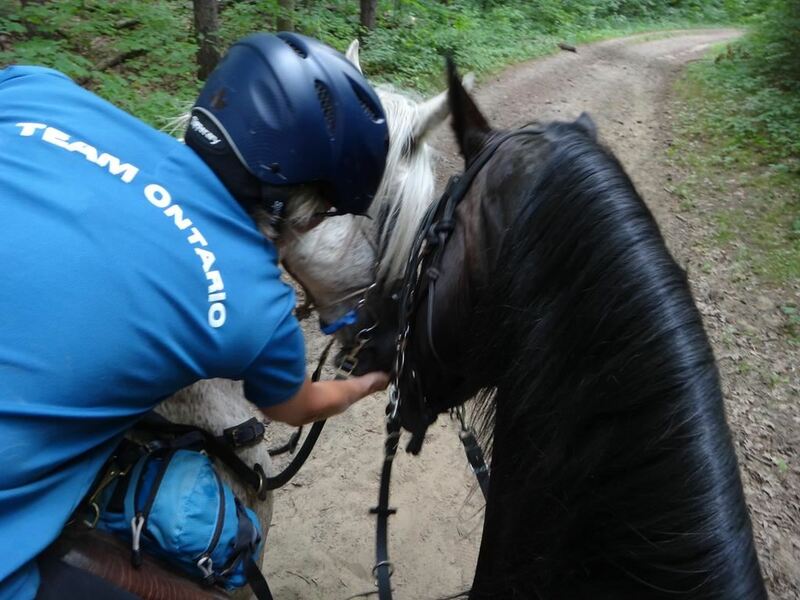 Today, I loaded Dressy on the trailer, and picked up Diego on our way to the Vivian Forest to ride. Diego has really started loading on the trailer well in the last little while. It was about 2-3 minutes to load him up this time. I suspect that he’s so happy to see Dressy that he doesn’t think much about resistance. The weather was beautiful and consequently the forest was very busy. Lots of people, bikes, and dogs. Mostly lots and lots of DOGS. All well-behaved, amiable dogs this time. There is a big rock along the trail to the dog pond that has a bronze plaque. Dressy has always been sure that big rocks are a really bad thing. Plaques ON rocks are downright evil monsters that stalk and kill horses. But I have finally convinced her that if she could just bring herself to sneak up and touch it, or even pretend to touch it that I will most likely come across with a delicious cookie. So she steels herself and sneaks up on it with quivering legs. 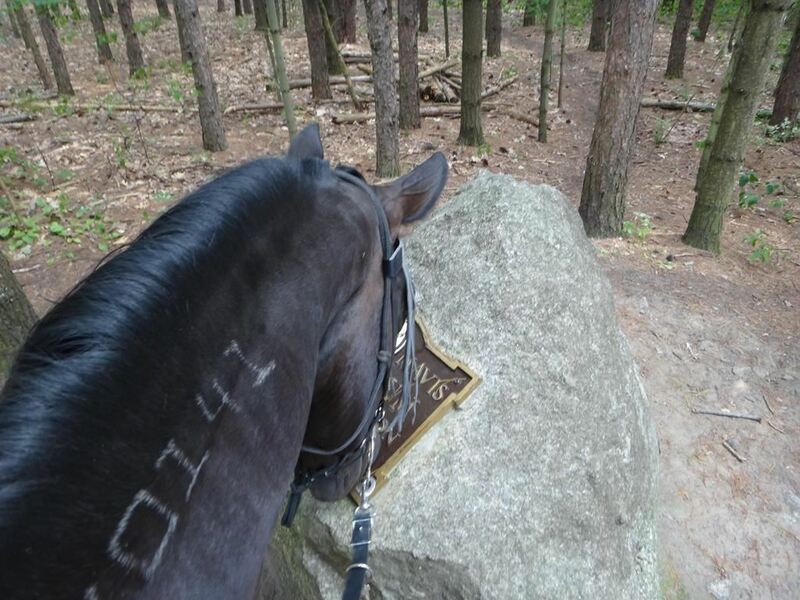 If I touch this evil horse-eating rock, do I get a cookie???? We went to the pond first, where we had our usual splashy bath, then headed out to loop around the trails. Dressy was quite calm and relaxed, and so was Diego. Though of course there were moments of excitement here and there. Dressy knows that I always carry a few cookies in my pommel pack, so she listens carefully for the sound of the zipper. But she’s also figured out that Misha carries cookies in her pack. And that Misha is very easily seduced into handing over the goodies. So sometimes she just reaches out, rests her nose on the pack, and wiggles her upper lip while looking coyly up at Misha. It always works. Do NOT feed those to Diego! He has no appreciation for cookies. I should get ALL of the cookies. Ha! Score! I got all HIS cookies too!!!! Lots of people at the pond. Dressy watches them carefully, but mostly hopes that they will have treats to hand over, just like Misha. That waiting family did not have goodies but they did admire her extravagantly, which she accepted regally as her due. Diego was again a very good boy. He did get himself caught up in a stick at one point and came to a very abrupt halt from a canter. Which smashed Misha’s face against his poll with a rather loud “thwack!” It sounded quite uncomfortable. But it really wasn’t bad behaviour, just clumsiness. 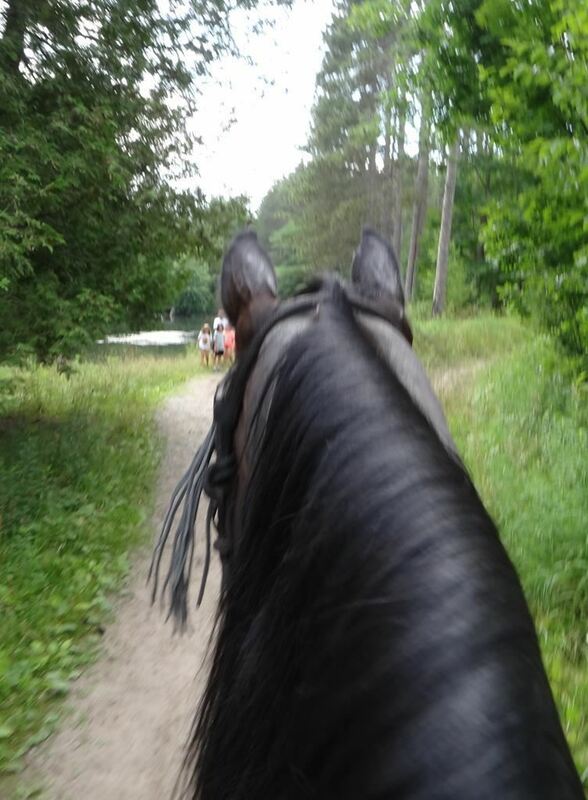 And at the end of the ride, he walked directly on the trailer without hesitating for even a split second. Well, Harry is back in the barn. He was claimed a few weeks ago, much to everyone’s chagrin. But he raced today, and the boss claimed him back. Harold, being his usual hard running self… also won the race. He’s the big chestnut with the green saddlecloth coming out of the 5th post position. A friend took this close up shot of King’s face the other day…. Rather lovely isn’t it? This is actually his “flirt for a cookie” face. He does a terrific eyelash flutter. 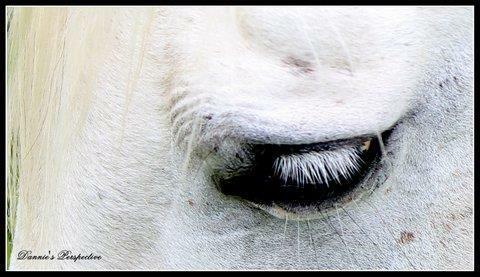 I love those white eyelashes against black skin. Photo by Dannie Wojtalik. I had a look at the weather from yesterday. Average humidity was 90% and it looks like it peaked in late morning. Combined with the actual temperature high of 30C, that put the heat index up to something astronomically unreasonable. So I guess that explains why Dressy and I got so overheated. I still feel awful today. Waves of nausea coming and going. Yuck. I guess I had a bit of heat stroke. Dressy seems to be fine. She’s hanging out in the barn, keeping Twister company. Last week, Twister did something to his eye, and now has a nasty scratch. So although he’s healing up, he is being kept in during the day so the sunlight doesn’t irritate it. Dressy stays in the stall next to him during the day, and King at night. They have a fan blowing on them, and it’s considerably cooler in there than outside. Dressy was napping in the breeze the last time I checked. I just withdrew my entry for Coates Creek ride, which is coming up in two weeks. I will just wait until the cooler weather of the fall to go to another ride. Dressy doesn’t do so well in heat, and I think I’m probably worse than she is. This is supposed to be fun after all, right? I took Dressy to Flesherton this weekend. We entered the 36 mile competitive trail ride. All week I watched the weather forecasts shifting towards hotter and hotter forecasts for the weekend. In the end I just shrugged and decided to go ahead and try, knowing that I would either slow way down and take extra time, or just pull at the mid-check. The first problem arose when I tried to put Dressy’s old Easy Boots on her hind feet. I managed to break the heel strap right out of the first boot. And since I rarely boot her hind feet (only for Flesherton or the Seoul’s Corners rides which both have lots of rock), I had no spares in the correct size. She wears a 0 in the old sizing chart. So I checked with Marg, and sure enough she had a pair of 0.5 EasyBoot Gloves. Which are much better than the old style boots anyway. So I borrowed those for the day. I rode with Sue T and her Morab gelding, Traver. Dressy goes along pretty well with him, since he does trot out fast enough that she doesn’t have to mince steps. It can be a struggle for her to travel with Arabs sometimes, since they trot slower than she does, but they canter a bit faster than her easy trot. Traver goes at a speed that she likes quite well though. She was very excited in the morning, and we zoomed around the ridecamp a bit wildly before the start. But it didn’t take too long for her to settle down and relax once she realized that no horses were going to gallop past. She sweated normally for the entire first loop, which turned out to be 23 miles. There was plenty of water on trail, and the trail marking was great and very easy to follow. The trail is quite beautiful. It winds through the Beaver Valley and has some huge climbs up the sides of the valley. There are quite a few water crossings, which was a blessing in the heat. She drank at every single one of them. Unfortunately though, I think she would have needed to do the whole ride following a river bed to have cooled down enough to complete this one. It just got hotter and hotter. There was a 10 minute hold at around 15 miles or so which helped a bit. But she probably needed a longer rest at about that point. For some reason the last eight miles to the mid-check were nearly unbearably humid. We walked some of it, but the sections around the fields just felt like we were baking in the sun, so there was not much point in walking. It was cooler for them to trot slowly. I was getting pretty concerned about her temperature, since I could really feel the heat billowing off her. And she was definitely not herself anymore. She did not really want to move out at all. We stopped to let the horses graze for a few minutes at the sign before the half mile trot in to the mid check. Dressy did eat. But she was panting and very inverted. At that point I really did not think she would pass the first parameter check (a heart rate of 64 bpm within 4 minutes of trotting in). Sue had a pit crew, her husband and a friend of hers. And they were a great help to me as well, sponging Dressy off to get her cool. There was just no way to get her temperature down before that check though, and she did fail to meet it. However, when she came back for her ten minute check (second chance at passing), she had come down to 58. We went to the vet for the rest of her check. She got a B on capillary refill (push against her gums with a finger and see how fast the pink colour returns). Her cardiac recovery index was 15/17, which is barely acceptable. She had a couple of minuses on her gut sounds. At that point I looked at the vet, and said “we should be pulling shouldn’t we?”. She agreed that it would probably be a wise choice. So that was it. We packed it in and asked for a trailer. When we went back to see the vet about a half an hour later, Dressy still had a somewhat elevated pulse. Not terrible, but not typical of her. I don’t remember the exact number, and our vet card is missing in action, but I think she was still somewhere around 58 or 60. So I was just as happy to be done. And then I started feeling pretty awful myself. I fought nausea for about two hours. I did take care of myself out on trail for a change. Drank lots of water, some Gatorade, and poured water over my head periodically. So I can’t even think of anything I should have done but didn’t. I have to say that I think Dressy recovered MUCH better than I did. She was enthusiastically trying to pilfer every other horse’s lunch in the vet check, and mowed through three flakes of hay in very short order once she was back at camp. Then she ate her entire hay bag on the trailer coming home. She was quite ravenous. I, however, was a bit a mess. Despite sticking my head in buckets of water, ice packs on my head, human electrolytes, Tums, a shower (in Marg’s trailer – Marg… provider of all things! ), change of clothes, and a nap. I kept getting queasy spells. Ugh. Me and my horse… the both of us are heat intolerant I think. Anyway, Sue and Traver went on to finish the ride without us. Elaine won top heavyweight and reserve champion, Solstice won top lightweight, and Jessica and her big grey thoroughbred, Earl (Distinctly Western) were the top middleweights. And for the first time, Jessica and Earl actually were the overall champions of the day too. Jess looked pretty darned pleased about that. As she should be… Earl had terrific heart rates. I did the scoring and I really did a double take when I saw them. Jessica has done a great job with that horse. Yesterday, I loaded Dressy up in the trailer, then went down the road to pick up Misha’s horse, Diego. He used to live here, but is just about two miles down the road now. So when he got on the trailer and discovered his old boss mare, he was very pleased. Or at least not quite so traumatized as usual about trailer loading. 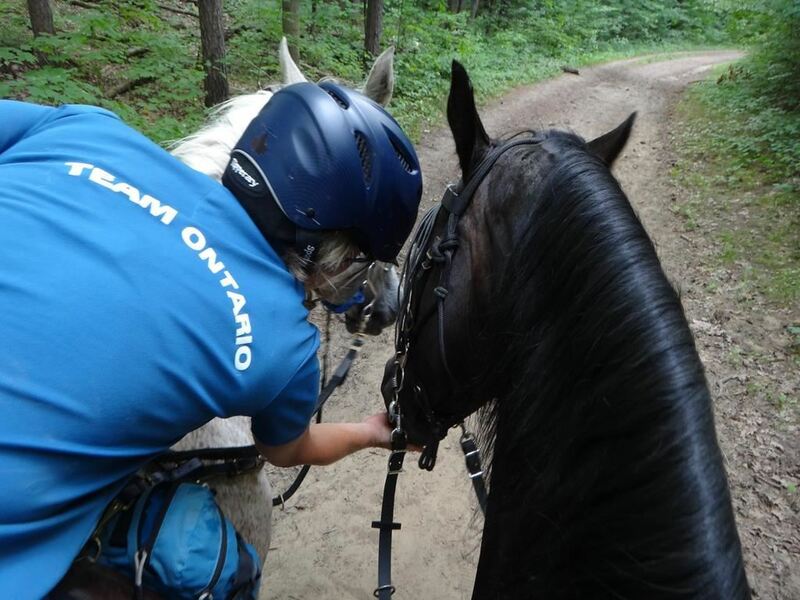 We took them over to the Vivian Forest for a long, slow, quiet ride. Diego’s little brain kind of imploded over the last year, and Misha has been having some troubles with him. So she’s had to go back to basics and do some of the basic training work that was glossed over. She hasn’t been trail riding him much over the last few months. She’s taken him to a training clinic, and worked with some different trainers. They’ve made a lot of progress. This was his first longer outing in a quite a while. We went quite slowly, mostly walking, and a bit of trotting. Diego was very happy to be out with his bossy friend, Dressy. Diego was so happy to be out with her, that he finally, after several years of not even wanting his toes in the water, waded in after her. He observed the splashing game for a while, then cautiously tried it himself. Yep, that felt good. Misha was very excited at how brave he was. Hmmmmm….. I think I could do that too Dressy…. Outta my way, you insignificant little Ayrab peasant. THIS is how you splash! Ana rode Ares again today. It was and still is dreadfully hot. They are forecasting 35C with a humidex of 42C. Which, for those of you who think in Farenheit, is 95F but feels like 108F. That is well beyond my comfort range and I have no intention of doing anything physical for the rest of the day. Yuck. But we managed to get Ares out by 9:30 this morning, so it was still bearable. Ana is looking more and more relaxed on Ares, so I told her that if she wanted to, she could trot him a few steps. A bit easier said than done… Ares was worried (Ares is perpetually worried), so he had his head up in the air and was tense. In a pacer, that’s a recipe for pacing. Which is exactly what he did, over and over. He also did something that I suspect was a “stepping pace” when the pace slowed down. There were definitely four separate beats, but was more lateral than a walk and faster. It is quite smooth. Pacing requires that a horse hollow their back and tighten their back muscles so there is no flex, which allows them to rock from side to side in the lateral movement of the pace. They tend to put their heads up and jam their noses out with an unflexed poll. 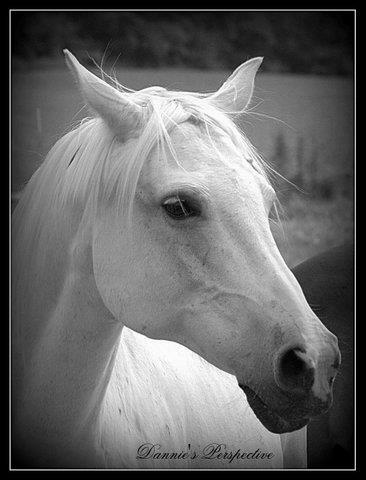 Trotting requires that the horse alternate relaxing the back muscles on one side while tightening the other side. So if you can get them to relax and put their head down (and even better if you can get some flexion), they are much more likely to trot instead of pace. Normally what I do with Dressy when she gets excited and breaks to pace (other than trying to get her to relax) is just go ahead and post to the imaginary trot. Dressy will usually (okay… sometimes!) accommodate me with a switch to trot. Ana is not confident about her timing though. So I had her practice some half-seat to get her a bit lighter in the saddle (and thus lighter on his back) and more balanced over her feet. Half seat is when you “two-point”, or ride with your behind hovering over the saddle instead of sitting on it. It can also be thought of as “standing in the stirrups”. After a few minutes of that, Ana was definitely feeling the burn in her thighs. But she worked hard and was much improved after a few minutes of practice. I had her lower her hands, take up slightly more contact with his mouth when she asked for trot, and after a couple of attempts she got him to go a bit more forwardly with his head lower, his back rounded slightly, and wonder of wonders… there was the trot. A big-striding, forward trot (which Ana, to her great credit, managed to stay with and not hinder). He maintained it for a full lap and received lavish praise for his efforts. Then we quit for the day and gave him a cool bath. Ares was really quite pleased with himself. He is not in the least bit lazy and seems to enjoy working. Or perhaps it would be more correct to say that he would do nearly anything for positive attention and is thrilled with an enthusiastic “good boy!” He’s an awfully nice little horse.